This is the era of the mega-box set featuring the complete recordings of a performer, or the collected works of a composer, or the anniversary of a record label. It keeps the catalogue full, is vastly cheaper than equivalent new recordings, and keeps music lovers like myself interested – and a little irritated. What do you do when you already have half the CDs in a mega-box: duplicate them to get the ones you don't have or shrug and miss out? Often the sets are so enticingly priced – the cost of two or three of the CDs first time round – that it is not much of an issue. 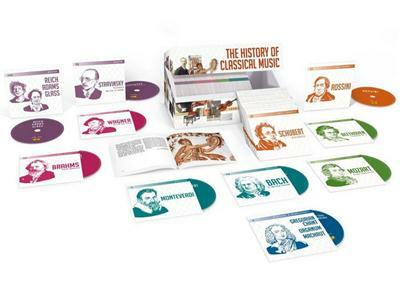 For their latest excursion into this genre, DG have found an ingenious marketing ploy: a set that aims to cover the entire history of what is loosely called classical music, from Gregorian chant to the present. DG notes there are 400 works by 80 composers, 120 hours of music by 150 artists, orchestras and ensembles, and a 250-page booklet with informative introductions. Annoyingly, the booklet lacks recording information – work, artists, timings – so you have to pull out the CDs and look at the back. Naturally there can only be a small sample from each era, but they are well chosen. Part of the fun about collections such as this is arguments about what has been left out. For example, I consider perhaps the most movingly profound music in the canon to be the Bach solo cello suites and the late Beethoven quartets. I could live to 400 and not plumb their depths. Neither is represented here. Among the five CDs devoted to Beethoven there is one quartet, but it is the middle-period first Razumovsky. Bach also gets five CDs, featuring two Brandenburg concertos and an orchestral suite, the Goldberg variations, Italian concerto and a fantasia, a CD of organ music, another of cantatas and one of excerpts from the St Matthew Passion. A good case can be made for the selection, not least as an attempt to express the breadth of Bach's genius. In general the works are excellent choices. The set starts with 11th-century Gregorian chant, continues through Renaissance (such as Tallis and Palestrina), Baroque (Monteverdi, Vivaldi, Bach, Handel, Purcell), classical (Haydn, Mozart, Beethoven), early Romantic (Schubert, Chopin, Schumann, Liszt), late Romantic (Bizet, Brahms, Tchaikovsky, Verdi) to modern (Debussy, Richard Strauss, Schoenberg, Stravinsky, Stockhausen, and contemporaries Reich, Glass and Adams). There are plenty of operas, but highlights only – Wagner's 15-hour Ring tetralogy gets one CD. No one has a better back-catalogue to draw on than DG, and the performers include many of the great names of the past half-century. Performances are first-rate. For example, the pianists include Kempff, Gilels, Barenboim and Pollini. This set is a superb way to start or enhance a music collection. CD 21 Haydn: Symphonies No.45 "Farewell", No.88 & No.104 "London"
CD 30 Beethoven: Symphony No.9 "Choral"
CD 32 Beethoven: Sonata For Violin And Piano No.9 "Kreutzer"
CD 36 Schubert: Symphony No.8 "Unfinished"; Symphony No.9 "The Great"
CD 37 Schubert: Piano Quintet in A "The Trout", String Quartet No.14 in D Minor "Death And The Maiden"
CD 47 Schumann: Symphony No.2, Symphony No.3 "Rhenish"
CD 53 Brahms: Violin Concerto in D, Sonata For Piano And Violin No.1 in G "Regenlied-Sonate"
CD 56 Smetana: The Moldau, From Bohemia's Meadows And Woods / Dvor?k: Symphony No.9, Op.95 "From The New World"
CD 78 Puccini: Tosca – Highlights; "Nessun dorma"
CD 80 Rachmaninov: Piano Concerto No.3 in D Minor / Scriabin: Symphony No.4 "Le Poeme De L'Extase"
CD 95 Gershwin: Rhapsody In Blue, An American In Paris / Bernstein: "Candide" Overture, Symphonic Dances From "West Side Story"
The post VA – The History of Classical Music on 100 CD’s [Limited Edition] (2013) appeared first on Freshwap.